The Tehran Revolutionary Court, in another illegal action, sentenced 8 men and women, active on Facebook to more than 123 years of imprisonment. Since the authorities have been unable to have any influence on society in trying to ban Facebook, with this action, they seem to be trying to create panic among social network users, and are using this to create and influence an atmosphere of oppression in cyber-space. According to the opposition site Kaleme, these people who were arrested last year and were interrogated at the IRGC Ward 2-A in Evin prison, were tried and sentenced collectively to more than 123 years of imprisonment in Branch 28 of the Revolutionary Court presided by Judge Moghayeseh,. These 8 people were charged with assembly and collusion against the national security, insulting the Supreme Leader, insulting the authorities, propaganda against the regime, blasphemy, and spreading lies and disturbing the public’s peace. The Revolutionary Court, based on Article 134 of the new Islamic Republic’s Penal Code has issued these sentences, giving them more than half of the maximum penalty. But, according to this same Article, only the sentence for the charge with the highest maximum penalty is enforceable. In this case, that would be the charge of assembly and collusion against the national security, which carries 7 1/2 years of imprisonment. While the issue of free access to the Internet has become one of the main challenges between the hardliner Judiciary and the administration of Hassan Rouhani and considering the inability of the hardliners to influence the cyber space activities of the people, they have resorted to giving these heavy sentences to make an example and to create an atmosphere of fear in order to stop the people from online activities. Kaleme had previously reported regarding the IRGC’s scenario and arresting of cyber activists in the summer and fall of 2013. Those people were arrested in Tehran, Shiraz and Sari. They were all held at IRGC’s Ward 2-A in Evin prison where they were interrogated and tortured. Currently they are being held in Evin prison and Gharchak prison for women in Varamin. 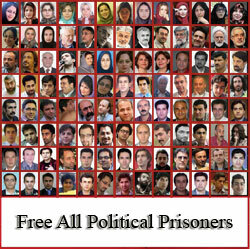 Despite the fact that the IRGC interrogators have charged these 8 people with various false charges, that the Court used to convict them, Kaleme’s reporter investigations showed that activities of these 8 people were limited to criticism of the ruling establishment’s policies, poems and songs of protest, spreading the news of the events of post-2009 presidential election and political-social satires. These activists, under pressure by the interrogators and with false promises of leniency, gave false confessions on national TV, apologizing for their actions, voicing regret for their Facebook activities, and warned about the ill effects of these social networking sites.